Ebonyi Governor, David Umahi, on Wednesday declared that the state is opposed to the agitation for Biafra and for restructuring. He said the state was not yet economically viable to seek independence. The governor explained that Biafra and restructuring would not benefit the people of the state. 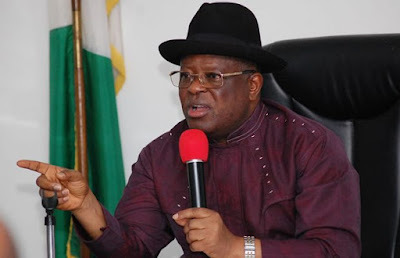 Umahi spoke at the Government House, Abakaliki, while responding to the presentation of a consultant on Internally Generated Revenue (IGR), Dr. Mike Abani, during the state executive council meeting. He maintained that Ebonyi totally depends on the federal allocation, while the internally generated revenue (IGR) is paltry. “When the issue of Biafra or restructuring is discussed, my heart jumps because Ebonyi State is not ripe for any”, Umahi said. “Ask yourself, what is it that we are producing? We totally depend on the federal government for allocation. The governor lamented that the people were over taxed, even as the money went into private pockets of government officials. He expressed optimism that the new measures being put to work would end the problem of IGR leakages in the state and assist his administration in fighting corruption.